In 1921, the first White Castle was opened in Wichita, Kansas by Billy Ingram. It was the first fast food burger place in the U.S. The name White Caste was chosen for specific reasons. The "White" was for purity and the "Castle" for strength. It was marketed that way to an American public that was weary of ground beef because of Upton Sinclair's book The Jungle, which exposed unsanitary and inhumane conditions in the meatpacking industry. At the time, pork was the most popular household meat. White Castle proved to be a resounding success and became famous for selling tiny little hamburgers known today as "sliders" – a name derived from the ease with which the sandwiches “slide” down the throat. 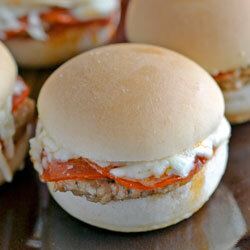 For this recipe, I make a pizza slider from pre-made sausage biscuits found at most grocery stores. 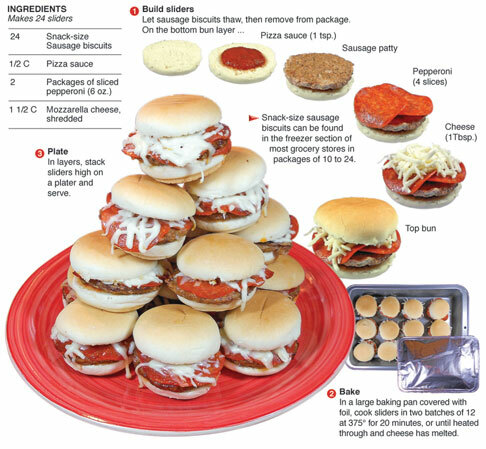 Pepperoni, pizza sauce and mozzarella cheese are added to the little sausage biscuit, creating a mini-pizza sandwich that should “slide” down like a White Castle burger. Simplicity. That is what I wanted to achieve with this recipe. I made this snack in a large quantity and it was as easy as cooking gets (beyond heating up frozen dinners). It's really meant to be a snack for Sunday's start of the NFL season. It's a true Man Bite – and a great snack to enjoy with a group of beer-drinking football fans as they settle in for a Sunday full of grid iron battles! For the newspaper version of the column I didn't have the space to mention the real intention behind this bite. I'm ok with that because I thought the history of the slider is actually better journalism, and I will choose an Upton Sinclair reference over football parties any day - I'm crazy like that.